The Convict Brick Trail commemorates some of the nearly 200,000 convicts who were transported to Australia between 1788 and 1868. The first brick was laid by Mayor Kim Polley on the 28 August 2003. Each brick details a convict’s name, their crimes and subsequent punishment. The trail is located on the footpath in High Street, Campbell Town and commences outside the historic premises known as the Fox Hunters Return which is adjacent to the Red Bridge. It extends to the CBD on the western side and to the IGA Supermarket on the eastern side. This brick is dedicated to those who died on their way to Australia either by disease or misfortune and they were not lucky enough to see our magnificent land. The trail of bricks is dedicated to the nearly 200,000 convicts who were transported to Australia for almost 100 years from 1788 onwards. Over 70,000 convicts came to Tasmania. Today, it is estimated that 80% or 4 out of every 5 Tasmanian have a little conflict blood in their veins. The trail begins here at the Red Bridge. This famous bridge was built entirely with convict labour. They hand made 1,250,000 bricks and then built the bridge on dry land. When completed they were then told to divert the river beneath it`s arches. This was accomplished by digging the new river course a kilometre on both sides of the arches. Built for hourse and cart it is today the oldest bridge in Australia still in use on a major highway, such was the workmanship of our forefather convicts. This convict built building, the Foxhunters Return still has the holding cells beneath it`s (sic) floors where the convicts were held at night. 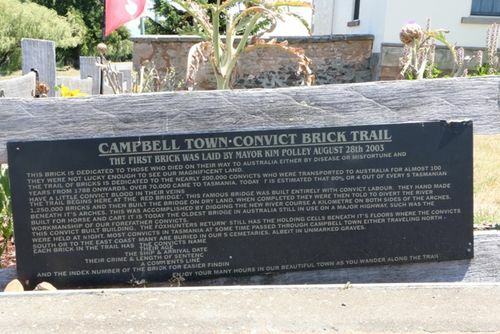 Most convicts in Tasmania at some time passed through Campbell Town either travelling north - south or to the east coast. Many are buried in our 5 cemetaries, albeit in unmarked graves. Enjoy your many hours in our beautiful town as you wander along the trail.